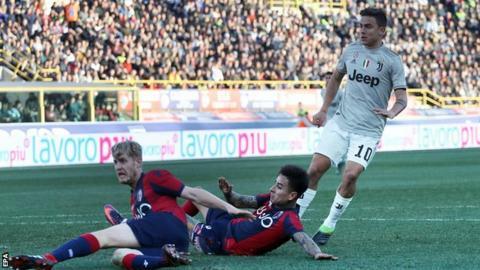 Unbeaten Serie A leaders Juventus needed a goal from substitute Paulo Dybala to beat Bologna. The Turin side, who have won the past seven titles, are 13 points above second-placed Napoli, who beat Parma 4-0 later on Sunday. Dybala converted from close range after Blaise Matuidi's cross was not cleared properly. Nicola Sansone almost equalised in injury time, but keeper Mattia Perin tipped his 20-yard shot on the post. Bologna, who are in the relegation zone, were unfortunate to lose, managing 18 shots to Juventus' six. Cristiano Ronaldo, who forced a save from Lukasz Skorupski in the closing moments, failed to score in a Serie A away match for the first time since 1 September 2018. He had scored in his past nine, one short of Giuseppe Signori's Serie A record, set between May 1992 and February 1993. Match ends, Bologna 0, Juventus 1. Second Half ends, Bologna 0, Juventus 1. Paulo Dybala (Juventus) wins a free kick on the left wing. Corner, Juventus. Conceded by Lukasz Skorupski. Attempt saved. Cristiano Ronaldo (Juventus) left footed shot from a difficult angle on the left is saved in the bottom left corner. Assisted by Paulo Dybala. Corner, Bologna. Conceded by Rodrigo Bentancur. João Cancelo (Juventus) is shown the yellow card for hand ball. Hand ball by João Cancelo (Juventus). Attempt saved. Riccardo Orsolini (Bologna) right footed shot from a difficult angle on the right is saved in the top left corner. Attempt saved. Nicola Sansone (Bologna) right footed shot from outside the box is saved in the top right corner. Foul by Diego Falcinelli (Bologna). Attempt saved. Mitchell Dijks (Bologna) right footed shot from outside the box is saved in the bottom left corner. Assisted by Godfred Donsah. Offside, Juventus. Rodrigo Bentancur tries a through ball, but Cristiano Ronaldo is caught offside. Substitution, Juventus. Giorgio Chiellini replaces Federico Bernardeschi. Delay in match Mario Mandzukic (Juventus) because of an injury. Attempt missed. Roberto Soriano (Bologna) right footed shot from outside the box is close, but misses to the left following a set piece situation. Attempt blocked. Federico Santander (Bologna) header from the centre of the box is blocked. Assisted by Riccardo Orsolini with a cross. Substitution, Bologna. Diego Falcinelli replaces Erick Pulgar. Federico Santander (Bologna) wins a free kick in the defensive half. Substitution, Juventus. Miralem Pjanic replaces Blaise Matuidi. Hand ball by Riccardo Orsolini (Bologna). Nicola Sansone (Bologna) is shown the yellow card. Attempt saved. Mario Mandzukic (Juventus) header from the centre of the box is saved in the top left corner. Assisted by Cristiano Ronaldo with a cross.